Yell.com, the UK business information portal styled on the Yellow Pages, has just announced the launch of Yell.com Mobile. The service aims to give access to the company’s information on two million shops and services to mobile phone users through a Java application and even provides colour maps and directions from your location. Yell.com Mobile is compatible with a large range of handsets, and a list is available from their main website. The service, excluding the premium services detailed below, is free – excluding normal network charges. To use the service for the first time, the applet has top be downloaded by texting “mobile” to 80248. You’ll then receive a message that will prompt the applet download through your GPRS connection. Once installed, users can search Yell by business type, name, location or browse by categories like “Gifts and Shopping” or “Days and Nights Out”. Once a business is located, users are offered three premium services, each costing UK0.25 (€0.36): Map, Directions or Business Card. The map is presented at 1:25,000 scale with seven levels of zoom, and directions can be tailored to driving or walking and are based on the user’s current location. The business card function simply copies the full details of the company you’ve searched for to your phone’s address book. Touted as the most efficient audio codec in the world, HE-AAC has been adopted as a standard by 3GPP, a collaboration between telecommunications standards bodies to produce global standards and specifications for mobile technologies. It’s good news for the developing AAC format, and good news for those in the mobile industry – there’s now a good chance there’ll be a common file format for music stores and mobile music. Convergence fans will also be able to transfer music between AAC compatible devices, meaning that it’s less likely they’ll have to buy the same track more than once. Furthermore, the adoption of a standard should encourage more publishers to venture out into mobile music. aacPlus can store a reasonably high-fidelity single track in just 500kb – obviously hand for the current generation of handsets that are doubly constrained by available bandwidth and memory capacities. HE-AAC uses a spectral band replication system from Coding Technologies to reconstruct high frequency sound from hints in the encoded file. By stripping out the high frequencies, only low-frequency sound needs to be encoded and stored, meaning that music can be encoded at roughly half the bit rate of standard AAC. Perfect if you listen to that “bang bang bang” music, but we’ve yet to test if the high-frequency substitution wheeze can encode other music types, such as those with lots of strings, accurately. Vodafone is launching their 3G voice services in Europe and Japan with a big splash by announcing 10 handsets at the outset. The range of handsets, which Vodafone is excited to tell us contains some models and designs that are exclusive to them, contains Europe’s first 2 mega pixel camera phone, CD quality music and stereo speakers. 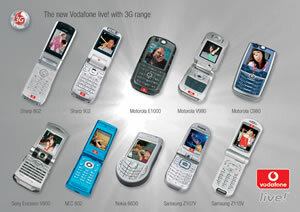 The Sharp 802, 902 and the NEC 802N are exclusive to Vodafone and a further three will be exclusive at launch. The launch features the handset that we are particularly excited about, the Motorola E1000, that includes has all of the desirable features including A-GPS for location based services. Vodafone Live!, their content play, is also heavily featured as this is the great hope in trying to gain back some of the billions they have spend to 3G licenses around the world. Following our calls to Vodafone, they confirmed that no further details on the handsets or services would be released before November. An interesting twist (of the knife?) for 3G licence holders, in Germany two public broadcasters want to levy a licence fees on 3G handset owners because they’re able to receive TV and radio. There was some muttering from the BBC about 18 months ago about letting UK licence payers have free access to the BBC’s Internet content while charging residents of others countries but I haven’t heard much about it since then. I suspect that this time the BBC won’t be raising the same questions as their German counterparts as they’re very conscious of their ability to licence their content to the 3G operators via BBC Worldwide.